Since my children are admittedly influenced by TV media, we use videos a lot in our homeschool curriculum. 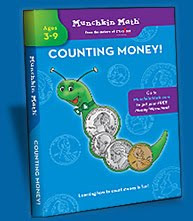 When we recently got to try out Munchkin Math: Counting Money on DVD, I was surprised at how interactive and not-at-all annoying this video was. Did it pass our entertainment test? Yes! Did my kids actually get anything out of it? Yes! *I wrote this review while participating in a blog campaign by Mom Central on behalf of Munchkin Math and received a sample DVD to facilitate my candid review. Mom Central sent me a gift card to thank me for taking the time to participate. My sons LOVE Munchkin Math, too!